404 pages | 27 B/W Illus. It is now widely accepted that there are important links between inactivity and lifestyle-related chronic diseases, and that exercise can bring tangible therapeutic benefits to people with long-term chronic conditions. Exercise and Chronic Disease: An Evidence-Based Approach offers the most up-to-date survey currently available of the scientific and clinical evidence underlying the effects of exercise in relation to functional outcomes, disease-specific health-related outcomes and quality of life in patients with chronic disease conditions. 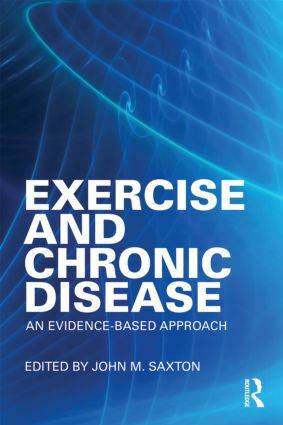 Each chapter addresses the frequency, intensity, duration and modality of exercise that might be employed as an intervention for each condition and, importantly, assesses the impact of exercise interventions in relation to outcomes that reflect tangible benefits to patients. No other book on this subject places the patient and the evidence directly at the heart of the study, and therefore this book will be essential reading for all exercise scientists, health scientists and medical professionals looking to develop their knowledge and professional practice. John M. Saxton is Professor of Clinical Exercise Physiology at the University of East Anglia, Norwich. His research interests are focused on the effects of exercise and lifestyle interventions on wide-ranging health outcomes in clinical populations (including cancer and cardiovascular disease) and individuals at risk of developing lifestyle-related chronic conditions.